As Hadar Sela of BBC Watch noted recently, the story was first reported by BBC Arabic, and disseminated throughout the media (along with the heart-breaking photo of Jihad Misharawi and his dead child) by the head of the BBC Jerusalem Bureau, Paul Danahar – and by other BCC employees. A U.N. official confirmed to the Free Beacon that this passage in the report was indeed referring to Misharawi. This information was first uncovered by Elder of Ziyon and has subsequently been reported by, among others, the New York Times, the Washington Post, AP, Huffington Post, and even by the BBC’s Jon Donnison. 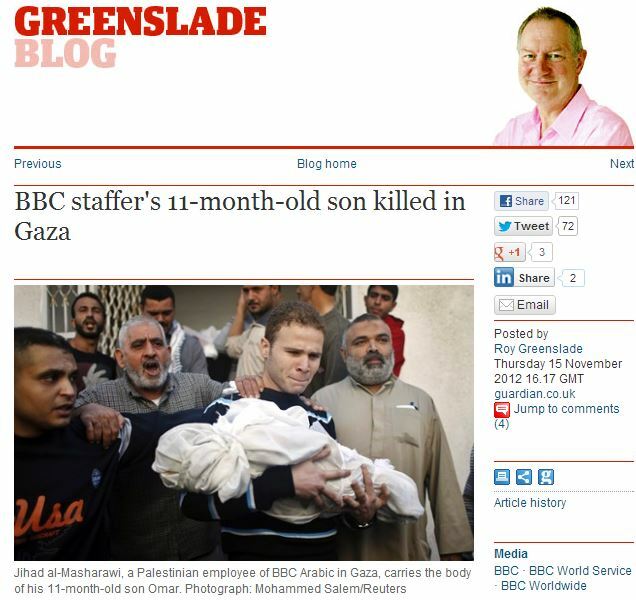 In November last year I carried a report that the 11-month-old son of a BBC staffer was killed during an air strike by the Israeli army on the Gaza strip. Omar Misharawi, son of the BBC Arabic service’s picture editor, Jihad, died from shrapnel wounds. But, according to an inquiry into the conflict in Gaza by the Office of the High Commissioner for Human Rights (OHCHR), the Israeli defence forces were not responsible for the death. A detailed report on several fatal incidents, issued on 6 March, states that the death of Omar and his aunt was more likely to have been the result of a rocket attack by Hamas. Though we’ll never know with 100% certainty if our post and/or Tweet prompted his correction, Greenslade nevertheless deserves credit for revisiting a story he originally got wrong, and setting the record straight. Update: the Guardian also published an AP report today also noting that the UN blamed the Palestinians for Omar Misharawi’s death. Update 2: The Guardian Readers’ Editor, Chris Elliott, contacted us to explain that Greenslade did not write his new story about the death of Omar Misharawi because of our post or Tweet. Look how long and how much effort it has taken to correct this one mistake! Think of the other mistakes that are corrected, if at all, in fine print on page 57 among the ads for support stockings. Think of the mistakes no one ever catches because evidence is lacking. I am grateful to all those who try to hold the media to account in this uphill business of insisting on fair play for Israel! Completely agree, Sally, but at least Greenslade has published this. I note, however, there is no hint of an apology, either from TG, the Guardian or any of the other sources I have looked at. I suppose that’s just too much to ask. But wait, it’s not over yet! His death is only likely to be the resault of rocket fire by Hamas. But maybe, just maybe if you close your eyes long enough and pray to Ali Baba the IDF will somehow creep back into the tale and will be blamed. Just once Guardianistas put blame where it belongs. Once place it squarely where it lies without this wriggling around like a worm on a hook. 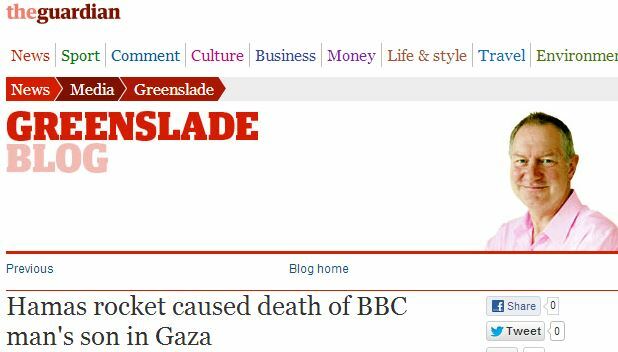 The apology should come first of all from Greenslade’s source, the BBC. You and everyone else who listens to or watches the BBC. You get my point, I suspect. The media are constantly making mistakes. This one is certainly one of the worse ones. But how often do MM publications apologise? That’s an easy piece of handwringing propaganda for Beeb/Graun axis — the copy almost writes itself! In other words, the BBC wants to place in readers’ minds from the very beginning the idea that there was a deliberate attack on Masharawi’s house, rather than an accident. “The son of a BBC journalist and two relatives killed in last November’s war in Gaza may have been hit by a misfired Palestinian rocket, a UN agency says. Indeed. Donnison’s new caption is ridiculous. Donnison’s bias against Israel is showing. Yeah. He did it because of the goodness in his heart. You’re not keen on Muslims are you, Jogi? Call him a “bigot”, “racist”, “scumbag” and “mental midget”. C’mon, you just love to do that. Don’t be shy. Where in my post did i mention “muslims” ? Sorry – just an inkling I had based on your name and your posts here. Oh Dear Mr Pretzelberg like the BBC and Al-Guardian still cant get it right can you AND i bet you still have not reseached Sikh/Mughal relationships have you??? Why would I need to research? Worried that it may not show muslims in the victimised spotlight that you for some reason only known to you that muslims opressed by all and sundry have to be shown in ?? Your retraction is wellcome but it would be far better if yourself and BBC make damn sure that what you print is correct and not keep blaming Israel because that is what seems the antisemetics of the world want to hear. Once printed it is not easy to make things right people remember the first story.